"If this project is successful it will cause a revolution in computing." That's the forecast of Michael Manfra, Purdue University's Bill and Dee O'Brien Chair Professor of Physics and Astronomy, Professor of Materials Engineering and Professor of Electrical and Computer Engineering, on a new long-term enhanced collaboration between Purdue and Microsoft Corp. to build a robust and scalable quantum computer by producing what scientists call a "topological qubit." Purdue President Mitch Daniels noted that Purdue was home to the first computer science department in the United States, and says this partnership and Manfra's work places the university at the forefront of quantum computing. "Someday quantum computing will move from the laboratory to actual daily use, and when it does, it will signal another explosion of computing power like that brought about by the silicon chip," Daniels says. "It's thrilling to imagine Purdue at the center of this next leap forward." In the computers that we currently use every day, information is encoded in an either/or binary system of bits, what are commonly thought of as 1s and 0s. These computers are based on silicon transistors, which, like a light switch, can only be in either an on or off position. With quantum computers, information is encoded in qubits, which are quantum units of information. With a qubit, however, this physical state isn't just 0 or 1, but can also be a linear combination of 0 and 1. Because of a strange phenomenon of quantum mechanics called "superposition," a qubit can be in both states at the same time. This characteristic is essential to quantum computation's potential power, allowing for solutions to problems that are intractable using classical architectures. Advocates of quantum computing believe this never-before-seen technology will create a new global "quantum economy." The team assembled by Microsoft will work on a type of quantum computer that is expected to be especially robust against interference from its surroundings, a situation known in quantum computing as "decoherence." The "scalable topological quantum computer" is theoretically more stable and less error-prone. "One of the challenges in quantum computing is that the qubits interact with their environment and lose their quantum information before computations can be completed," Manfra says. "Topological quantum computing utilizes qubits that store information "non-locally" and the outside noise sources have less effect on the qubit, so we expect it to be more robust." Manfra says that the most exciting challenge associated with building a topological quantum computer is that the Microsoft team must simultaneously solve problems of materials science, condensed matter physics, electrical engineering and computer architecture. "This is why Microsoft has assembled such a diverse set of talented people to tackle this large-scale problem," Manfra says. "No one person or group can be expert in all aspects." Purdue and Microsoft entered into an agreement in April 2016 that extends their collaboration on quantum computing research, effectively establishing "Station Q Purdue," one of the "Station Q" experimental research sites that work closely with two "Station Q" theory sites. The new, multi-year agreement extends that collaboration, and includes Microsoft employees being embedded in Manfra's research team at Purdue. Manfra's group at Station Q Purdue will collaborate with Redmond, Washington-based Microsoft team members, as well as a global experimental group established by Microsoft including experimental groups at the Niels Bohr Institute at the University of Copenhagen in Denmark, TU Delft in the Netherlands, and the University of Sydney, Australia. They are also coupled to the theorists at Microsoft Station Q in Santa Barbara. All groups are working together to solve quantum computing's biggest challenges. "What's exciting is that we're doing the science and engineering hand-in-hand, at the same time," Manfra says. "We are lucky to be part of this truly amazing global team." Mathematician and Fields Medal recipient Michael Freedman leads Microsoft's Station Q in Santa Barbara working on quantum computing. "There is another computing planet out there, and we, collectively, are going to land on it. It really is like the old days of physical exploration and much more interesting than locking oneself in a bottle and traveling through space. We will find an amazing unseen world once we have general purpose programmable quantum computers," Freedman says. "Michael Manfra and Purdue University will be a key collaborator on this journey. I'm not interested in factoring numbers, but solving chemistry and materials science problems, and most ambitiously machine intelligence. Curiously, we need great materials science and transport physics – Mike Manfra's work – to build the systems we will use to do quantum computing and, thus, to usher in the next era of materials science." Purdue's role in the project will be to grow and study ultra-pure semiconductors and hybrid systems of semiconductors and superconductors that may form the physical platform upon which a quantum computer is built. Manfra's group has expertise in a technique called molecular beam epitaxy, and this technique will be used to build low-dimensional electron systems that form the basis for quantum bits, or qubits. 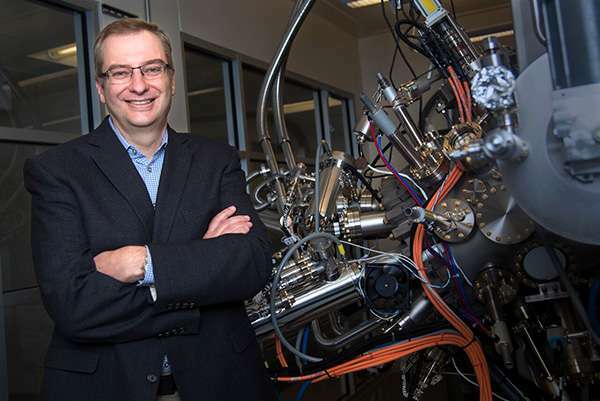 The work at Purdue will be done in the Birck Nanotechnology Center in the university's Discovery Park, as well as in the Department of Physics and Astronomy. The Birck facility houses the multi-chamber molecular beam epitaxy system, in which three fabrication chambers are connected under ultra-high vacuum. It also contains clean-room fabrication and necessary materials characterization tools. Laboratories for low-temperature measurement of the materials electronic properties will be conducted in the Department of Physics and Astronomy. Suresh Garimella, executive vice president for research and partnerships, and Purdue's Goodson Distinguished Professor of Mechanical Engineering, says the tools and laboratories found in Discovery Park have enabled Purdue to become a world leader in several areas. "Combining these world-leading facilities with our incredibly talented and knowledgeable faculty, such as Professor Manfra, has placed Purdue at the forefront of research and development of nanotechnology, nanoelectronics, next-generation silicon transistor-based electronics, and quantum computing. To have Purdue contribute to the construction of the world's first quantum computer is be a dream come true for us," he says.